View of the landscape around the Center for Land Use Interpretation, Wendover, Utah, United States. The Foundation has supported the development of Grounded, a project that combines elements of the documentary and guided tour through the use of wireless technology. The project is allied with The Center for Land Use Interpretation (CLUI) (1) (Wendover, Utah and Culver City, California), which is dedicated to exploring the human-land dialectic through multidisciplinary research involving both artists and scientists. This research gives rise to thematic exhibits, guided tours and lectures focusing on sites which, owing to their lack of tourist attractions, have often suffered neglect. The Center's residence program, initiated by Igor Vamos, allows artists and scientists to explore Wendover's physical and historical features in an innovative way. Situated in the flats separating the mountains of Nevada and Utah, the Wendover region is known in particular for its Great Salt Lake and ageless desert expanses. However, it has also been subject to considerable military and industrial use. (2) It is this period of history that Vamos evokes in Grounded. As indicated in the Center's publications on Wendover, (3) bombing and training activities and massive extractions of raw materials have left indelible marks on the landscape, which may appear at first as the vestiges of natural geological phenomena. Wendover has also served as a laboratory for testing satellite location systems, better known as Global Positioning Systems (GPS). (4) Without the Center's land-use interpretation projects, these features of the landscape would remain invisible. Grounded is pursuing these explorations through an innovative use of geolocation equipment originally tested by the military, which reveals the historical sub-strata of the region. Participants wear headphones and carry a handheld computer equipped with a wireless Web connection and GPS receiver that delivers audio and photo documentary related to their physical coordinates. As viewers make their way through the environment, their physical experience is linked to the site's historical and political reality. In the first phase of research, Igor Vamos developed an open-source Web browser plug-in and authoring software that triggers Web data based on latitude and longitude. The second phase involved the gathering of documentary material (texts, archival footage, photographs, etc.) to recount the unique story of the Wendover area, and then integrating these elements into the program that will be called Grounded . With these technological components and documentary segments in place, the project serves as yet another pedagogical tool of The Center for Land Use Interpretation. The public can follow the project's evolution by visiting the Center's Web site. (2) For further details on the organization, see The Center for Land Use Interpretation, The Center for Land Use Interpretation, Culver City, [n.d.], 6 p. brochure. (3) Cf. 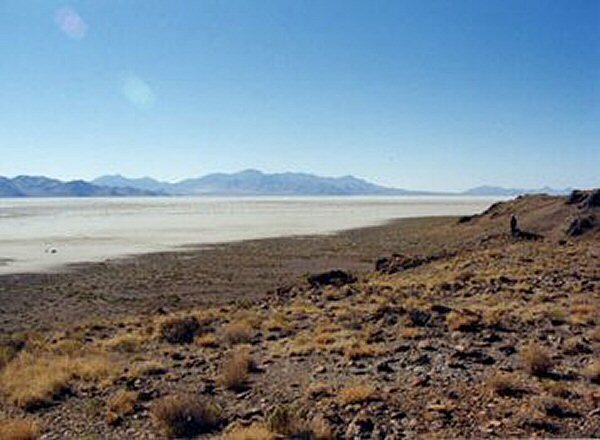 Around Wendover: An Examination of the Anthropic Landscape of the Great Salt Lake Desert Region, The Center for Land Use Interpretation, Culver City, 1998, 57 p.
(4) These systems determine, from a remote distance, the precise geographical and altitudinal positions of an object. His work takes the form of strategic interventions in public sites and electronic networks.